Ya know SDK designers are so lucky to have so many talented ladies on their creative teams...I just don't think they get enough praise so I am going to try and post each day some of the wonderful layouts you will find in our gallery! 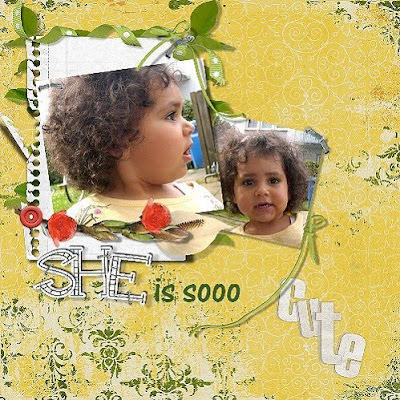 Saira2007 used Pixelfairy Design - Summerfun Kit for her 'sooo cute' layout! More fabulous products for you this week...from the SDK Designers!!! Grab it 'On the House' from the Store before it is going...going...gone! We hope you have enjoyed this month's kits...starting next weekend will be a new Supa Digi Kit, YAY! A day late and a dollar short...hahahahaha...I am always running late. You know, I always try to be on time where ever I go but it just doesn't happen. Poor DH gets very frustrated with me as he hates to be late to anything...oops. He has gotten wise, when I ask what time we have to be somewhere he now tacks on an extra half hour...lol...love that man! Want to know more...visit Michelle's blog here! Of course not being home for two days meant I had to try and catch up on the jobs at home. As family is coming for the wedding, I figured I had better tame the gardens...everything got a good trim. I squeezed in a quick grocery shop and it really was quick as I didn't get anything for dinners for the week...lol...who needs to eat! Next was the swimming pool...I still don't know why we have one it gets used maybe 3 times a year...hehehe. Still, that is clean now and not the same colour as the grass nearby...EEK! Oh and managed to queeze in a dress fitting, DIL and I went to the bridal shop to have a final fitting for her dress. She looked so pretty and I think we found a tiara and veil to match the dress...woohoo! But...but...but...things did not go so well Monday as one of my external HDDs decided not to play nice...only the one with all my kits in progress, photo, tools and goodies :( Thank heavens for my DD's boyfriend (bit of an IT whiz), he managed to backup all my data and transfered it to another HDD...PHEW!!! DH and I are off on a road trip tomorrow, cameras at the ready...YAY!!! We are going to a place called Albury, 6 hrs north-east of home. We are on a business trip...hehe...well we have to pick something up for work but then we will be on the look out for things to snap. On the way I think we are going to stop at Glenrowan, which is bushranger country...or the place Ned Kelly made his last stand. If we have time the next day and depending on the weather of course, Holbrook might be the place to go...it has the top half of a submarine in the centre of town...true story...it's a replica of the HMAS Otway! Hi Ladies, I am sorry I have been MIA...a tummy bug has kept me pretty immobile since Friday :( ...but I didn't forget today is Freebie Wednesday...hehehe! lljd2007 with 'Ballerina Girl' a very sweet layout with too cute embellishments! SammyD's 'Roses in my Garden' great spot colour completmented by the colour mat. Diane's Bacardi Rum Cake had us all saying YUM!! Theses Ladies scored themselves a $4 coupon to Belanna's Designs...well done Girls! PS. if you're a newsletter subscriber you will get an extra 10% off coupon in this week's newsletter...woot!! woot!! Need to focus, focus, focus on what's important...hmmmm that would be another freebie...YAY! Link Removed - The QP coordinates with this month's Supa Digi Kit - Gone Camo'. Well I'm meant to be in focus or at least the camera is with the 5omm lens I just got...hehehe...it's suppose to be good for portrait photography but I think I will have to practice a little more before I am happy with how I am using it. I thought it would be great to have for the wedding...yes I know I am the Mother of the Groom and should be enjoying the day...but I just can't let this photo opportunity pass me bye :) plus with so many family members gathered together, I am sure it will get a good workout...lol. Still they are the ones missing out on money, at least if my Dad builds me stuff I know it will not fall apart...hahahaha...unlike my building skills. Oh...Oh...pergola building...that will be another photo opportunity...WOOT! Playing Cards and a Freebie!!! So what have I been playing...August is a bit of a Birthday month for this family...now in years gone by I was very organised and had cards premade so I could just grab one that suited the person, scribble a note inside and pop it in the post...but I have been very, very bad for the last two years. Time to stop that and get organised again! Here are a couple of cards I whipped up...they are all digital which I have never done before. They came out pretty good but I am thinking that next time I might just print the embellishments separately and cut them out to stick on instead. Yes, yes I know that seems a little silly but I like the cutting out and gluing bit...hehehe. I might have to put on my wish list for Christmas one of those scrapbook cutting machines but I just don't have a clue what would be a good one to buy, each time I read up on the different ones I just confuse myself. Any suggestions on which one to get??? **enabling alert** Ok so I know it's not Friday, but New Release Saturday just didn't sound right...hehehe! 12 assorted papers and 16 elements in bright spring colors. A glittery ICY Alpha for fun winter layouts- Uppercase Letters with Numbers and some puncutation in 40 seperate .PNG files.